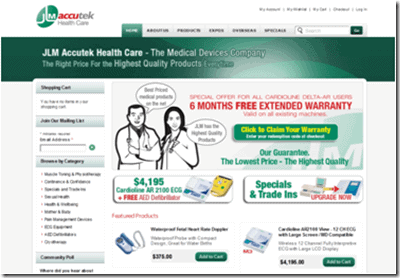 The Client: JLM Accutek Health Care is an Australian based health and medical company that focuses on selling medical equipment, devices and consumables to public hospitals, private practice and consumers. JLM Accutek and Medtel (medtel.com.au) are a part of the Getz group (www.getz.com), a multinational medical company with 50 locations in 25 countries. The Brief: Traditionally JLM Accutek has focused on selling B2B to hospitals and physicians but intends to diversify its range to target GPs and consumer health. JLM Accutek wishes to develop a hybrid website that shares the same database and web engine, but populates 2 websites for both its B2B & B2C markets. • Develop a new e-comm distribution channel to target consumers with lower priced health & lifestyle products, competing against retail pharmacies & specialty stores on cost. • e-Commerce solution with multiple sites. • Custom modification of numerous features covering 5 pages. to allow quoting only feature. •Large scale project 320 hours development time. •Created 3 websites that are easy to use and update for the company internally while representing their different brands and divisions.